To view a slightly larger image right click and select "VIEW IMAGE"
The Terms and Conditions at the bottom of the page apply to EVERYONE. Below is a PDF list of parts a fellow RC30 owner sent me. He asked if I would put it up on here. The purchasing terms and conditions below do not apply unless Kevin wants them too. You can contact Kevin at his email below. There are some VF and FZR parts in there too. 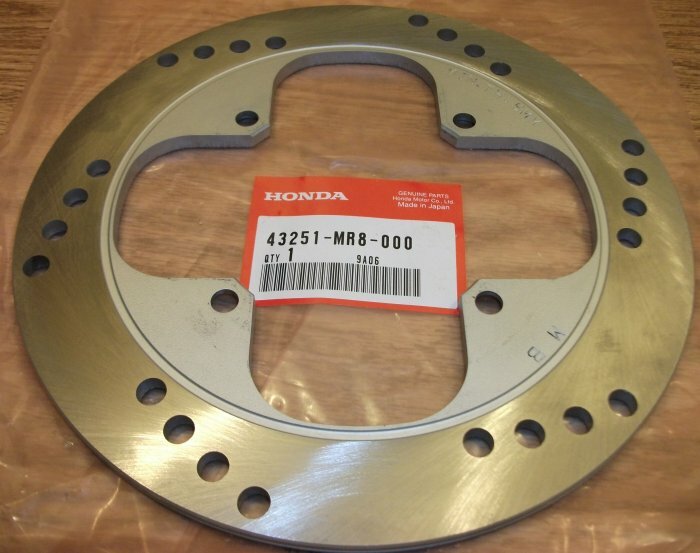 Original Honda NC30 (VFR400R) rear brake disk. 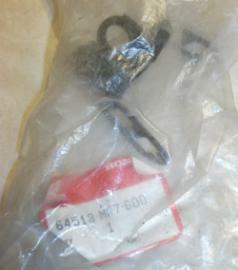 Brand new, never used, taken out of the package for measurements only. I may have had bolts in it hand tight by the looks of it. Never torqued on or used though. Does not fit RC30 as near as I can tell. $120 Can. 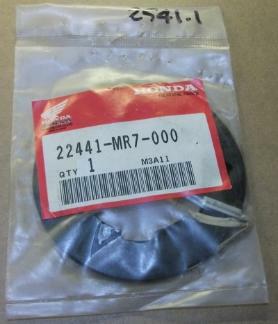 Cheap if you want an original Honda disk that is new. Packaging: Original/Opened as In Picture. Original Honda steering stem. New. These retail for $735 at a dealership if they are still available. Make me an offer. Was going to use it on my RC30 project but I went with stock RC30 parts. This fits all RC45 models. If you want to see more pictures of this go here. I bought it from them and the pictures are of the one I bought. 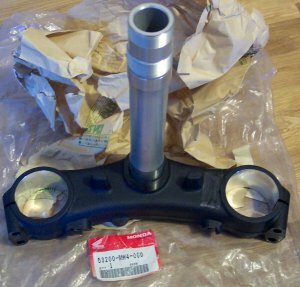 Also fits a stock RC30 damper. 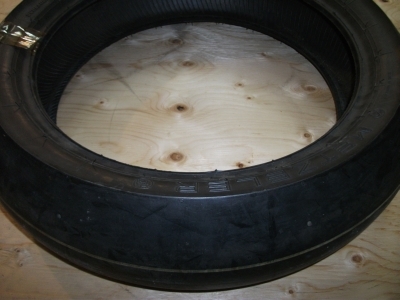 This is a rear racing slick left over from Canadian Superbike racing days and intended for the RC30. It is new however it should be considered usable for a static bike display only. 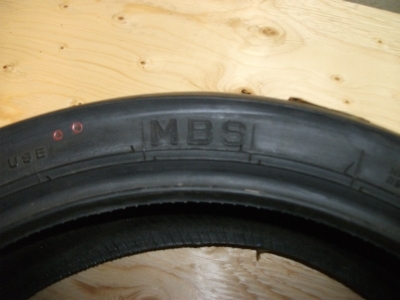 Made in Germany with MBS technology. Unmounted dimensions - 648 mm diameter, 173 mm wide. Type: Tubeless (but for display a tube might be a good idea). Condition: New/Unused/Never Mounted but it has aged. 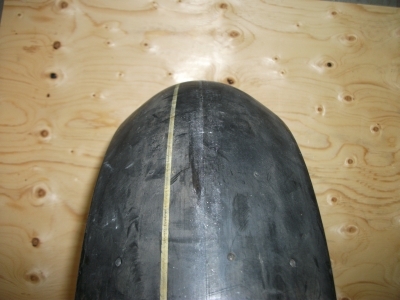 No cracking looks very good but is now too hard to use for riding. Packaging: None, never had any. 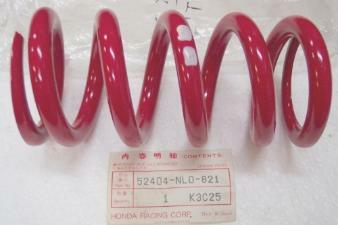 Original Honda diaphragm clutch springs. Discontinued by Honda. I have multiples of these, not just the one set in the picture. 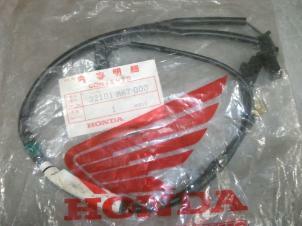 Original Honda wiring sub harness. Supplies power, ground and control wiring for the fans. Plugs into main harness (not included). Discontinued by Honda. Suitable for all specifications and years of the Honda RC30. Original Honda wiring coupler bracket. Supports 6 wiring harness plug connectors on the Japanese, New Zealand and Australian specification RC30 (small headlight bikes). Discontinued by Honda. Original Honda front cowl bracket. Discontinued and hen's teeth rare. Works on all large dual round headlight bikes. The little rubber bumper is still properly attached. This bracket is also suitable for the Canadian or US spec bikes that use part no. 64513-MR7-720. The only difference is the lack of the little bendable tab for the one wire. If you have any questions please contact me before purchasing. 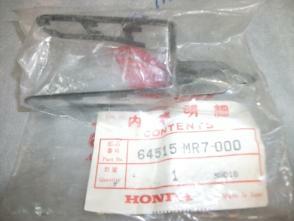 All parts are suitable for the Honda RC30 unless noted otherwise. Purchaser is responsible for verifying the part is suitable for their purposes prior to purchase. I endeavor to describe used parts accurately. New parts usually don't need much of a description, though some new parts may show some shelf aging. All parts have been boxed/bagged and properly stored in a climate controlled environment (cool, dry and dark) on proper shelving. My internal Ref. No. must be referenced if you have any questions. This number is listed with each part. AS A BUYER OF ANY ITEM ON THIS WEBSITE YOU AGREE TO THE FOLLOWING TERMS AND CONDITIONS AND AGREE TO HAVING FULLY READ AND UNDERSTOOD ALL TERMS AND CONDITIONS. ALL PRICES DISPLAYED ON THIS PAGE ARE ARE IN CANADIAN DOLLARS. ALL SALES ARE FIRST COME, FIRST SERVED. I HIGHLY RECOMMEND INQUIRING IF A PART IS STILL AVAILABLE BEFORE PURCHASING. I WILL ONLY SHIP TO A CONFIRMED PAYPAL SHIPPING ADDRESS. IF YOU HAVE NOT CONFIRMED YOUR PAYPAL ADDRESS DO IT BEFORE PURCHASE OR YOUR PAYMENT WILL BE RETURNED MINUS ANY FEES. ONLY AFTER THE ITEM IS PURCHASED I WILL PACKAGE IT AND GET A POSTAGE COST. I THEN INVOICE FOR THE POSTAGE. I DO NOT MARK UP SHIPPING COSTS OR CHARGE FOR A STUPID BOX, TAPE OR MY TIME. I RELAY TO THE BUYER WHAT I PAY TO SEND IT. I WILL USE THE POST OFFICE FOR SHIPPING (SEE RESTRICTIONS BELOW FOR EXCEPTIONS TO THIS). ALL ITEMS ARE SOLD AS DESCRIBED WITH NO RETURNS, REFUNDS, OR CANCELLATIONS AFTER INITIAL PURCHASE. SEND ALL QUESTIONS BEFORE PURCHASE THROUGH THE CONTACT PAGE WITH THE REFERENCE NUMBER OF THE PART(S). PARTS WILL BE SENT ONLY TO THE CONFIRMED SHIPPING ADDRESS. IF YOUR PAYPAL ADDRESS IS NOT OR CANNOT BE CONFIRMED YOU MUST SEND THE FUNDS THROUGH PAYPAL AS A "GIFT". THE ACTUAL COST OF THE ITEM WILL BE SHOWN ON THE SHIPPING DOCUMENTS IN $CAN. ALL PACKAGES WILL BE SENT BY METHODS HAVING A TRACKING NUMBER. YOU WILL BE SENT THE TRACKING NUMBER AS SOON AS I SHIP THE PACKAGE(S). FOR PURCHASES OVER $250 CAN SIGNATURE CONFIRMATION IS REQUIRED. I WILL NOT UTILIZE THE BUYER'S OWN SHIPPER OR COURIER. I DO NOT ACCEPT WIRE TRANSFERS. BUYER IS RESPONSIBLE FOR DUTIES AND TAXES IN THE DESTINATION COUNTRY. 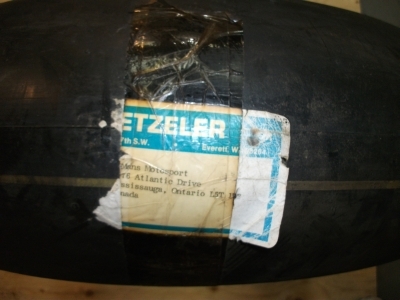 I WILL ONLY SHIP TO ITALY AND SPAIN BY PUROLATOR (COURIER) DUE TO CONCERNS OVER THE DESTINATION COUNTRY'S ACCOUNTABILITY. CONFIRMED ADDRESS PAYPAL IS OK, ASSUMING PAYPAL WILL CONFIRM YOUR ADDRESS. IF PAYPAL WILL NOT CONFIRM YOUR ADDRESS SEE ABOVE. IF YOU DO NOT COMPLY WITH THE ABOVE TERMS, OR COMPLETE A SUITABLE SHIPPING COST PAYMENT WITHIN 1 WEEK OF INITIAL PURCHASE I MAY ELECT TO REFUND ANY MONEY MINUS ANY FEES PAYPAL CHARGES. I REFUSE TO BE RESPONSIBLE FOR OTHERS WHO DO NO READ THIS OR ARE SLOW IN RESPONDING. I conduct business professionally, I expect the same in return.